The moving and storage crew has dismantled the second floor shelving in preparation for more drastic renovations. 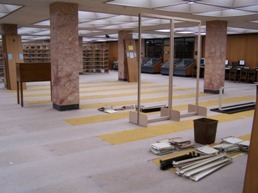 They’re taking it down to the nuts and bolts, stripping away the old carpeting and ceiling tiles, and calculating how many additional electrical and phone lines will be needed. We look forward to sharing the new space with our new residents (Writing Center, Math Lab, & Learning Support Services). During construction, second floor staff — Outreach, Digital Projects, Director’s Office, Business & Administration — will temporarily relocate to other office areas in the building. For safety reasons, we can’t let anyone into the construction area, but we will post photographs so you can watch our progress. Call our service desk at 610-519-4270 to request retrieval of main stacks books in the A – DX call number range.